I called in at Bredon Church to see the grave site of Bishop John Prideaux. He spent his last years living with his daughter and son in law and was buried at the church following a large and well attended funeral. Details of his life, death, will can be found on my other blogs on this site. I was disappointed to see that his gravestone was placed underneath a rug in front of the altar. I hope that this was because the congregation are worried that it will be damaged by constant footfall. 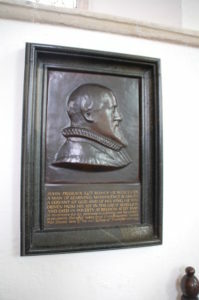 There is a plaque on the wall acknowledging him, but stating that he died a pauper. This is a common and repeated misconception which has been passed down. He certainly lost his Bishopric and church livings and position at Exeter College, Oxford following the Civil War, but he left a good deal of money and possessions in his will. It was his sons in law who sold off his possessions quite swiftly, following John’s death. I don’t know how much his two remaining daughters were happy with that. In addition to the blogs on the site, I have already written and published one book about John Prideaux and more are in the pipeline.